We've been anxiously waiting for the official release of the Audi R8 5.2 FSI Spyder for what seems like an eternity. From being taunted by various rumors, photochops and spy shots, we now have the first look at what the car will officially look like. As you can see, it's not far from the spy shots we've seen earlier. 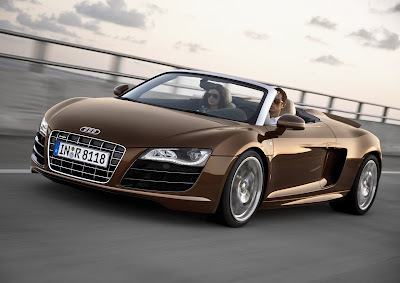 To complete the roadster package, the roof was not the only thing the Audi R8 5.2 FSI lost. At first glance you'll notice the R8's signature side blades are missing along with a solid painted hood covering the 5.2 liter V10 beneath. The R8 Spyder boasts the ability to fully drop it's top in 19 seconds at speeds up to 31 mph. That's just about as fast as a drunk sorority girl at mardi gras. Although the Spyder configuration adds a total of 476 pounds to the R8's frame, the 525 horsepower 5.2 liter V10 propels the R8 Spyder from 0-62 mph in 4.1 seconds, topping out at 194.5 mph. US launch information for the R8 Spyder is not available.